De vez em quando, gostaríamos de vos apresentar neste espaço alguns tradutores de relevo. Um deles foi sem dúvida o lusitanista Georg Rudolf Lind, nascido em 1926 em Berlim. Uma grande parte da sua vida científica e profissional foi dedicada à obra de Fernando Pessoa; a extraordinária notoriedade de Pessoa nos países de língua alemã deve-se em boa parte às traduções de Georg Rudold Lind. Mas Lind não traduziu apenas Pessoa, tendo também dado a conhecer aos leitores alemães outros autores de língua portuguesa, como Vergílio Ferreira, Agustina Bessa Luís ou Joaquim Maria Assis e Maria Alice Barroso. Entre 1975 e 1985, Georg Rudolf Lind ensinou Filologia Românica na Universidade de Graz. Quando se jubilou, regressou a Portugal, onde faleceu, em 1990, na Malveira da Serra. Não há como sobrestimar a sua contribuição para as relações luso-alemãs. Now and again we would like to present in this section some noteworthy translators. One of them was, without doubt, the expert in Portuguese Georg Rudolf Lind, born in 1926 in Berlin. Lind devoted a major part of his scientific and professional life to the work of Fernando Pessoa; the extraordinary renown of Pessoa in German-speaking countries is largely due to the translations by Georg Rudold Lind. 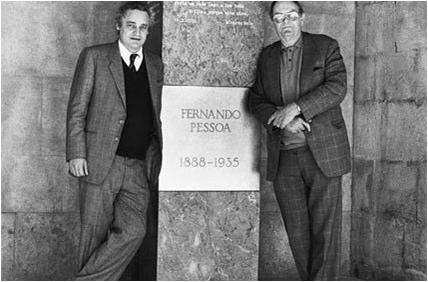 Nonetheless, besides translating Pessoa, Lind also made other Portuguese authors known to German readers, such as Vergílio Ferreira, Agustina Bessa Luís or Joaquim Maria Assis and Maria Alice Barroso. Between 1975 and 1985, Georg Rudolf Lind taught Romance Philology at the University of Graz. After retiring, he returned to Portugal, where he died in 1990, in Malveira da Serra. We cannot overestimate his contribution to Portuguese-German relations. Gelegentlich möchten wir Ihnen an dieser Stelle bedeutende Übersetzer vorstellen, und einer von ihnen war gewiss der 1926 in Berlin geborene Lusitanist Georg Rudolf Lind. Einen großen Teil seines wissenschaftlichen Lebens und seiner Arbeit als Übersetzer hat er dem Werk Fernando Pessoas gewidmet; die außerordentliche Bekanntheit Pessoas im deutschsprachigen Raum verdankt sich nicht zuletzt den Übersetzungen von Georg Rudold Lind. Aber Lind hat nicht nur Pessoa übersetzt, auch andere portugiesischsprachige Schriftsteller wie Vergílio Ferreira, Agustina Bessa Luís oder Joaquim Maria Assis und Maria Alice Barroso hat er deutschen Lesern bekannt gemacht. Von 1975 bis 1985 lehrte Georg Rudolf Lind Romanistik an der Universität Graz. Nach seiner Emeritierung zog es ihn wieder nach Portugal, wo er 1990 in Malveira da Serra verstarb. Sein Wirken für die deutsch-lusitanischen Beziehungen ist kaum zu überschätzen.